ISTE 2018 was AMAZING! Thank you, Educators! 3 expo hall days, 2 epic vans, 1 incredible ISTE. A big huge thank you to everyone who stopped by the Bloxels EDU booth in the Expo Hall, and to all who came out to our Coffee GBL event! Our voices are hoarse and our feet are killing us, but we would go another 3 days if we could! We had a BLAST showing you all our new Bloxels EDU App, Hub, Educator Handbook, and Student Workbook. 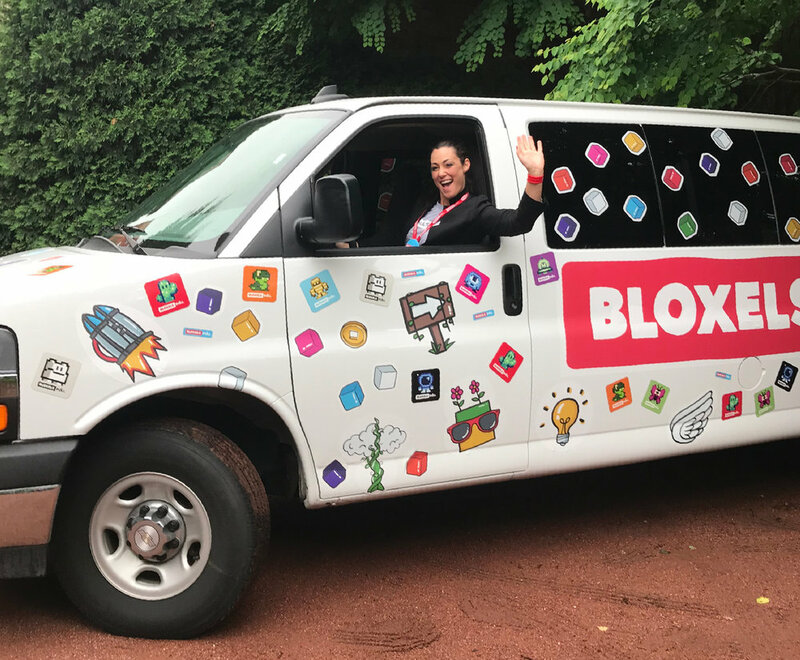 We knew we had to drive up to Chicago in style, so we decorated our cargo and passenger van in a TON of Bloxels EDU stickers and magnets. At our booth we had a ton of Educators stop by that were already using Bloxels in their classroom. We loved showing off all the new features Bloxels EDU has that will help make the classroom game building experience more intuitive and seamless than ever before. The new UI makes it not only look more snazzy, but feel more snazzy. ACTION BLOCKS! Orange Exploding Blocks are now Action Blocks, which you can carry around, build logic puzzles, place in different areas of your game, or toss to defeat Enemies! Class Libraries make collaboration a breeze! Simply upload any game, art, character or background to the Class Library to let anyone in your class view, download, and play! Coffee GBL raffle winner Andrea takes home a Classroom 5-Pack! We hosted a Coffee GBL up on Wednesday morning so we could sit down with educators and go a little more in-depth on Bloxels EDU. At tables we placed our Educator Handbooks, Student Workbooks, Gameboards and iPads so educators could look through and play with the new materials and app. At the meet up we held a raffle for a Classroom 5-Pack, and gave each educator a class in the Hub. We love hosting meet ups where educators can sit down and talk to each other about how they integrate Bloxels into their curriculum. Our ISTE Classroom 5-Pack twitter contest winners will be announced throughout the week! Stay tuned to see if you’re one of the lucky Bloxels EDU 5-Pack winners! Once again, thank you to all who stopped by our Bloxels EDU Booth and Coffee GBL meet up! We had such an amazing time getting to meet all you incredible educators. See you all again next year! ISTE is Only a Week Away!